The following post was scheduled many months ago and due to the very nature of the posting I questioned the advisability of going forward. After prayerful consideration I contacted the surviving spouse and was given permission to go ahead and publish this wonderful true-to-life love story ~ sadly interrupted only a few months ago.
! A FARM BOY, A LOST CARD, and A '55 CHEVY ! Steve’s Version: I remember the first time I saw her. She had long, shiny brown hair, teasing eyes, and pouting lips that at the time reminded me of a movie star. Rumor had it that she already had a boyfriend. It was just as well. I was too embarrassed to talk to her anyway. I had grown up in the country and felt much more comfortable with trees, animals, and tractors. But my name being Bly, and hers being Chester, we were destined to sit next to each other in every class that had alphabetical seating assignments. In our freshman year that turned out to be English class. Now, I want to be the first to admit I was not the most cool dude at high school. I was a farm boy there with my flat top hair cut, blue jeans, white t-shirt, and black high-top tennis shoes. By Christmas of our freshman year I still hadn’t gotten up enough nerve to speak to this talkative young lady more than a few times. But she had made my list of the ten cutest girls on campus. Finally, I told this guy that I had made other plans for the first football game of our senior year. I had intended to go with several girlfriends, but that fizzled out when they got dates of their own. So, I wound up going alone and meant to sit in the cheering section. Just as I entered the stadium, I noticed my former boyfriend walking my direction. In a search for a way to avoid him, I shot a glance at the seats and noticed Steve halfway up, a jokester of a boy from my college prep classes who seemed to always delight in teasing me. Meanwhile, I often graded his tests when they were passed to the person behind. My first practice as his editor. Now, he sat there, all by himself. In a quick moment of decision, I raced up the aisle and scooted next to him…just in time. The other guy passed below. Not my proudest moment. I made some lame excuse to Steve about my sudden friendliness and meant to move on. But, I lingered instead. We had a fun time watching the game together. Then, he offered to take me to pizza afterward and home. Impressed with his manners and his blue Chevy with white top and red interior, I viewed him in a whole new sphere. “Why, yes, you did,” he said. Steve again: Back when I first saw her at age 14, I had no idea in the world that this cute, young teen would some day be my wife. And I never, even in my wildest teenage fantasy, dreamed that she would also be my very best friend. There’s nothing hidden from her. In the process of the last 48 years, we have built not only a family and a ministry, but also a partnership and friendship that has weathered storms and struggles, sorrows and delights as we discovered the joy of marriage. . .the ultimate invasion of privacy. 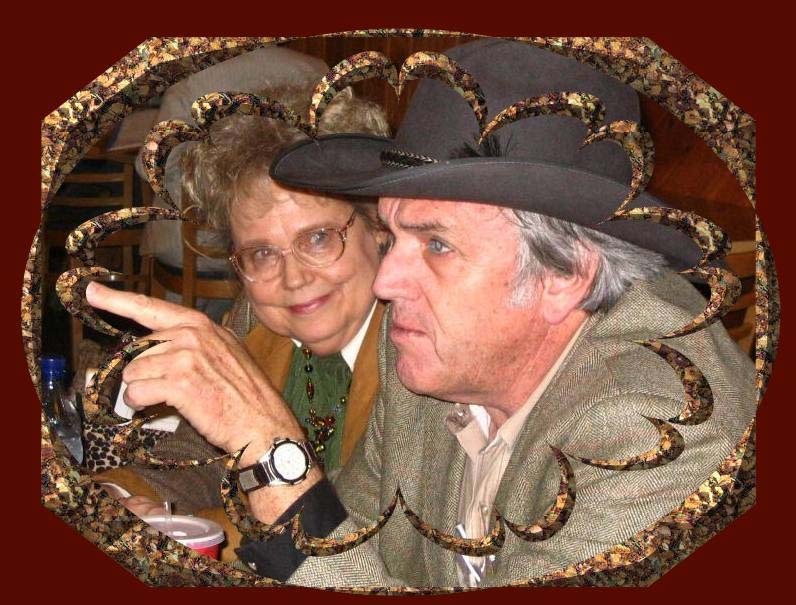 Stephen and Janet Bly have published 120 books…his, hers and theirs. Christy Award winner for westerns, Stephen’s newest novel is Throw The Devil Off The Train, a western romance hardback. The Blys have 3 married sons, 4 grandchildren, and 1 great-grandchild. They lived in northern Idaho at 4,000 ft. elev. on the Nez Perce Indian Reservation. This was such a great story for me - my dear hubby and I met September 9th of 1973 and we married November 30, 1973 - 38 and counting! I sincerely pray my wonderful JERRY will be able to say the same of our marriage as Stephen has of theirs if we're privileged to reach our 48th before one or both of us graduates to Heaven. Thank you, Janet, for sharing this with my followers and readers - such a tender treasure, I'm sure!